The VLOOKUP function is the most popular lookup and reference function in Excel. It is also one of the trickiest and the dreaded #N/A error message can be a common sight. This article will look at the 6 most common reasons why your VLOOKUP is not working. The last argument of the VLOOKUP function, known as range_lookup, asks if you would like an approximate or an exact match. In most cases people are looking for a particular product, order, employee or customer and therefore require an exact match. When looking for a unique value, FALSE should be entered for the range_lookup argument. This argument is optional, but if left empty, the TRUE value is used. The TRUE value relies on your data being sorted in ascending order to work. The image below shows a VLOOKUP with the range_lookup argument omitted, and the incorrect value being returned. If looking for a unique value, enter FALSE for the last argument. The VLOOKUP above should be entered as =VLOOKUP(H3,B3:F11,2,FALSE). Maybe you are looking to use multiple VLOOKUPs to return different information about a record. If you are planning to copy your VLOOKUP to multiple cells, you will need to lock your table. The image below shows a VLOOKUP entered incorrectly. The wrong cell ranges are being referenced for the lookup_value and table array. The table that the VLOOKUP function uses to look for and return information from is known as the table_array. This will need to be referenced absolutely to copy your VLOOKUP. Click on the references within the formula and press the F4 key on the keyboard to change the reference from relative to absolute. The formula should be entered as =VLOOKUP($H$3,$B$3:$F$11,4,FALSE). In this example both the lookup_value and table_array references were made absolute. Typically it may be just the table_array that needs locking. The column index number, or col_index_num, is used by the VLOOKUP function to enter what information to return about a record. Because this is entered as an index number, it is not very durable. If a new column is inserted into the table, it could stop your VLOOKUP from working. The image below shows such a scenario. The quantity was in column 3, but after a new column was inserted it became column 4. However the VLOOKUP has not automatically updated. One solution might be to protect the worksheet so that users cannot insert columns. If users will need to be able to do this, then it is not a viable solution. Another option would be to insert the MATCH function into the col_index_num argument of VLOOKUP. The MATCH function can be used to look for and return the required column number. This makes the col_index_num dynamic so inserted columns will no longer affect the VLOOKUP. The formula below could be entered in this example to prevent the problem demonstrated above. As more rows are added to the table, the VLOOKUP may need to be updated to ensure that these extra rows are included. The image below shows a VLOOKUP that does not check the entire table for the item of fruit. Consider formatting the range as a table (Excel 2007+), or as a dynamic range name. These techniques will ensure that your VLOOKUP function will always be checking the entire table. To format the range as a table, select the range of cells you want to use for the table_array and click Home > Format as Table and select a style from the gallery. Click the Design tab under Table Tools and change the table name in the box provided. 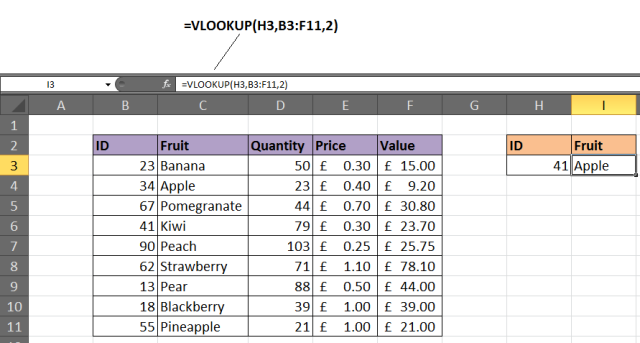 The VLOOKUP below shows a table named FruitList being used. A limitation of the VLOOKUP function is that it cannot look to its left. It will look down the leftmost column of a table and return information from the right. The solution to this involves not using VLOOKUP at all. Using a combination of the INDEX and MATCH functions of Excel is a common alternative to VLOOKUP. It is far more versatile. The example below shows it being used to return information to the left of the column you are looking in. The VLOOKUP function can only return one record. It will return the first record that matches the value you looked for. If your table contains duplicates then VLOOKUP will not be up to the task. Should your list have duplicates? If not consider removing them. A quick way to do this is to select the table and click the Removes Duplicates button on the Data tab. Check out the AbleBits Duplicate Remover for a more complete tool for handling duplicates in your Excel tables. Ok, so your list should have duplicates. In this case a VLOOKUP is not what you need. A PivotTable would be perfect to select a value and list the results instead. The table below is a list of orders. Let's say you want to return all the orders for a particular fruit. 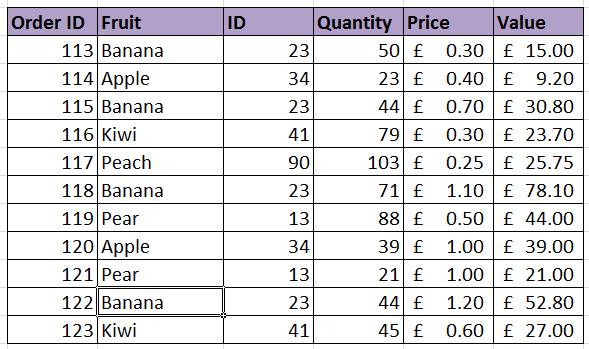 A PivotTable has been used to enable a user to select a Fruit ID from the report filter and a list of all the orders appears. This article demonstrated a solution to the 6 most common reasons a VLOOKUP function is not working. Armed with this information you should enjoy a less troublesome future with this awesome Excel function. Alan Murray is an IT Trainer and the founder of Computergaga. He offers online training and the latest tips and tricks in Excel, Word, PowerPoint and Project. 122 Responses to "6 Reasons Why Your VLOOKUP is Not Working"
The trapfall of VLOOKUP being not able to "look to right" wasn't known to me before. Very helpful! Me too is facing a similiar error. I'm not sure what you need. Do you mean all columns? You would need a VLOOKUP in each. A formula can only return to one cell. Sometimes the error may be because it has not calculated properly. If you have calculation set to manual rather than automatic, this can also cause an error when using vlookup or index match. Once the worksheet calculation is set to automatic, it works again (set it to automatic by going to the Formulas tab and then Calculation Operations and set to Automatic). THANK YOU!!! Hours wasted, but many more hours saved. The Automatic setting in Calculation Operations did it. Karma credits in the heapful submitted your way. Thank you so much Dan! This annoying setting has wasted me hours before! This has saved my hours of hair-pulling ! I have been working with vlookup for a long time now but had not encountered this problem before. Many thanks ! Hopefully someone can help me. My vlookup is returning the correct values in my columns but it returns the same value until it comes across another non-zero value. For example the correct value of row 10 is 259 but it will return 259 for rows 11, 12, and 13. Row 14 will correctly show 864 but then rows 15 and 16 will too. Have the same issue. VLOOKUP is used only for values in ASCENDING order! Try Index Match combination instead. Hard to say why without seeing the spreadsheet but would expect there to be an error in the lookup value argument. I would check the reference. Having calculation set from manual to automatic is very helpful. Save lots of time. Thank you, thank you, thank you for the manual - automatic guide. VLOOKUP won't be able to. It will only return the first name from the sheet. You will need more than 1 VLOOKUP. Or a macro would be needed for multiple occurrances of a name. Thanks for sharing. I had some hidden columns so my VLOOKUP was not working! Fixed it after readong Point 3. on your list. i am doing a very simple lookup and I am getting the #n/a. Trying to pull a number into my master. The first column on both is my ref. the formula is =vlookup(A2,PLANC,2,false). Very very simple. I checked to make sure there was a match and there was and no duplicates were found. Help! Hard to say exactly without seeing the file. Check that there is definitely a match, so no spaces after the number. And also check the formatting of both the lookup_value and on the table_array to check they are the same. Item B1007080SHF3MDO2BS***GG is not present on the target range; Item B1007080SHF3MDO2BSR**GG is there, with a required response value of 409. When I apply the VLookup to both fields, I get the value of 409 for BOTH, so the 'exact value' part of the formuala does not seem to be working. I have both lists sorted A-Z. It does not seem to matter if I format both columns as text or numbers, same issue (the full data set column does have values that are numbers only & alpha-numeric in both the search criteria and the target range). It looks like the VLOOKUP is using the ** characters as a wildcard. That might be. My ERP system only allows * as special characters so all my item number data exports have * in them. Do you know of a way to prevent this? You might be able to concatenate a string. Wrap the * in "" to indicate that you want to refer to that character literally and not as a wildcard. Otherwise you might be able to use the EXACT function with INDEX and MATCH instead of VLOOKUP. Information on this can be found below. I have not tested this, but think it should work. This function does what its name suggest and ensure the strings match. Watched the YouTube video and it was brilliant instruction! Saved me loads of time and frustration. My table has duplicates in lookup cell, but the value against it is unique, what should I do if I want all the values populated? Now if I want both USA and Columbia in how should I get it, as vlookup only gives USA? @Gautam Lapsiya Yes the VLOOKUP will only return the first answer. 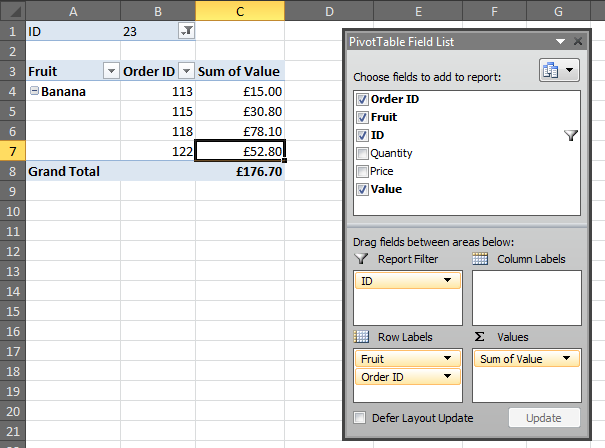 An option is to use a PivotTable like in the last example. Why does my vlookup give the same answer? Thank you! My error wasn't any of these, but it was good to be encouraged to look through everything piece by piece. Turns out I had the initial column and the lookup_value formatted differently--one was Number and the other wasn't (somehow...) So, another goofy mistake, but maybe it will help someone. Thank you Alan, you helped me with The Table has got Bigger. VLOOKUP Cannot Look to its Left was my issue.. thanks! Why VLOOKUP with "TRUE" condition is not working on dates? It should work with dates no problem. Ensure the table is sorted in earliest to latest by the date. Do you have any idea why my VLOOKUP stopped refreshing automatically for ALL my spreadsheets. In your example, when I change I3, I actually have to click into the formula in J3 and hit enter for it to pull the refreshed value. I think the cells containing the VLOOKUP's are formatted as text. I would select the cells and check the formatting on the Home tab. It may also be that you have manual calculation switched on. Click the Formulas tab and then Calculation Options. I want to use VLOOKUP with two diffrent spreadsheet which containt no match value on both, in that case is it possible to apply VLOOKUP in this manner?? It is possible to apply a VLOOKUP to two different spreadsheets. Ensure both workbooks are open when you write the VLOOKUP. Not sure what you mean by the contain no match on both, but VLOOKUP can help check for matches so sounds like it would work. Hi - VLOOKUP is working fine for me apart from only returning the first letter, i.e returning only 'J' instead of John. Any ideas? Not a clue. VLOOKUP will return all of the content from the cell, so as long as the full name is in there it will work. Very true. The formatting of the values stored and the one searched for must be consistent. Hi. Thanks for your reply. Unfortunately, it's still not working, even with all values consistent. Totally baffled! 447350 447135 this is where the formula stops working as it returns the incorrect value and then the values become N/A. I have checked the data is has no blanks, both columns are general input. I think your VLOOKUP by the sound of it is comparing columns A and B. And in this case it is stopping at that point because it is not a match i.e. 447350 is not equal to 447135. While selecting rows and col in vlookup formula (the area where to search) the row col reference (eg. 8RX4C) is not displaying, It is getting difficult to count manually for larger tables. I'm struggling a little with the question but I think you are asking about entering the col index num when using a big table. 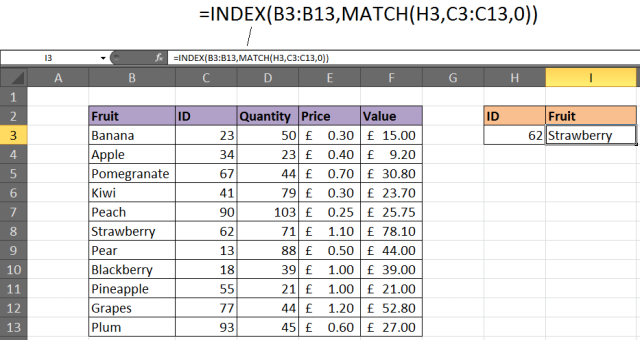 In such an example the MATCH function can be used to look along the header row and locate the column number for you. This is done in a similar way to the 5th example of this tutorial and in the link below. I'm doing a VLOOKUP which I do every month to put dates next to asset ID numbers. My LOOKUP results are exactly the same for every ID number when i copy down my formula. So the results for the first row are correct but the rest are wrong as they're the same as the first. It sounds like your lookup_value is absolute so is not changing when you copy the formula. You might need to remove the dollar signs from the first part of your VLOOKUP. It shows how to use VLOOKUP to return the last match if there are duplicates. You can adapt this easily for the 2nd match though. Another issue can be "unknown characters" instead of spaces being used. I was looking at a file with 2 sets of data that looked the same, but they were extracted by different means from a database, and on one set of data, spaces were not spaces but some other character. Found it by checking if 2 items that look identical were actually identical (they weren't, according to Excel), and the only possible characters that could be different were those I couldn't see, i.e. spaces. Yes sometimes data needs to be cleansed after importing from a database before formulas such as VLOOKUP can be run. Text functions such as SUBSTITUTE and TRIM are great for this sort of tasks. The Find & Replace and Power Query tools are also brilliant for cleansing data. can someone please help urgently. i am trying to find the status for the sales but it is only working for the price. pleasee help!!! i don't know what to do!! I am unable to do vlookup between 2 google sheets. 2 sheets are not getting linked. I do not use Google Sheets but am under the impression it works in a similar way. I would re-check the VLOOKUP for potential mistake. i make a table using vlookup but its not working properly. I can't really explain without more information. Maybe check the typing of the entries. You say it works for some and not others. Sounds like a mis-type on those entries not working. Or maybe the second reason above. I keep receiving a #REF! error when using a VLOOKUP between two workbooks on a network share. If I have the VLOOKUP workbook open (showing the #REF! errors) and then I open up the workbook that contains the table array - then the #REF! errors disappear and the cells contain the correct data. It seems as if I must have the source workbook open in order for the link between the two to function correctly. Do you have any suggestions that I could try? I’m trying to use VLOOKUP to look up values with a combination of FS500000, 1000000, F500000. The VLOOKUP is finding combination FS500000 and F500000, however fields with 1000000 are showing the #NA error. The cells are formatted as general (also tried switching to text), i've removed "hidden" fields and inserted TRIM within the formula, but still no luck. I did suspect this would be due to the formatting. General is not adequate, Excel will still view 1000000 as a number. Formatting as text is good. Just ensure the lookup value and the first column of the table array are the same format. So both need to be text. Thank you very much!! It worked. I forgot to lock my table. Thank you guys, great page! I used vlookup but it will only return the first match. Sometime an aircraft comes multiple times in a month. How do I solve this? Yes VLOOKUP will only return the first match. You can use a PivotTable to perform actions like show all invoice # for a particular aircraft. Otherwise if you wish to populate a bunch of cells with this info then you are looking for a macro probably. I have tried all the solutions the article mentioned, still failed then I tried this, always start the looking table with the value you are looking for in the first column e.g. VLOOKUP(sheet1!A2, sheet2!$C$2:$E$84, 1, FALSE). That is you are looking for value in column C in sheet2 that matches value in column A in sheet1. It is magic! to solve a problem of VLOOKUP that happens when we copy data from different data sources. Thanks for the tip JimmyNZ. another tip: if you're looking up numbers, make sure they are not 'numbers formatted as text.' They'll break the formula. Yes to add to that... the formatting of the lookup value and the first column of the table array must match. Whether they both be numbers, or both be numbers formatted as text, they must be the same. My vlookup is only working for the top half of my spreadsheet and then stops working on any cell past row 270. My vlookup table is a named range, first column in order by dates, returning column is to the left of the reference column and formatting matches and is not text. Anyone have a clue how to fix it? Hi Judy, If the VLOOKUP does not look past row 270 I would check out the named range as that would seem the problem. You can edit this named range from the Formulas tab and the Name Manager. The formatting of the lookup value and first column of the named range must be matching. And the col index num (returning column) must be to the right of the reference column. The problem in this article on VLOOKUP cannot look to the left can help with this. Thus, when the file is doing a Vlookup for smaller values, they are present, but pulling #NA for these big values. These values are the result of a report so I cannot change these values. But based on these values, I will have to pull data from other columns. Th eproblem is that it does not like the Tile "~" in the text. You may need to find a way of removing or replacing this for the purpose of the lookup. Don't need to remove it from the cell if important. Just temporarily for the lookup. Could use the SUBSTITUTE function in the VLOOKUP. Apologies because I am not completely sure what you mean. First thought is to check you have entered False or 0 in the last VLOOKUP argument, so it is not dependent upon order. I hope you solve the mystery. Thank you, I had omitted the FALSE entry. Everything is fine now. Great to hear. Thanks for letting me know Gerry. Great site and thanks so much for the time you take helping us all! My issue is I have brought in data from 2 different user's spreadsheets and the source data has leading zeros. We used a custom format o############ for both source and Col.A of Vlookup table - but the source data shows in the formula bar the leading zero whereas the vlookup col A does not show the leading zero in the formula bar and thinking this is why I keep getting N/A? Yes the format of both columns must be the same for VLOOKUP. If the zeros are showing in the formula bar, it sounds like it is stored as text. You could use the VALUE function on that columns data to convert it from text representing a number to a number. This is helpful. Can you tell me how to convert from special to general without losing the leading zero's? You can try formatting the values as Text from that menu instead of General. This example assumes your number is in A1 and you need 5 numbers including leading zeros. These results can then be copied and paste values over the current ones. This will change the format to text but keep the zeros. The only differences found is the lookup value cell. 7015028 has a caution mark at top left saying "The number in this cell is formatted as text or preceded by an apostrophe", where 7043640 is normal cell. Both cell format as GENERAL. Ok yes, if that column is the first of the table array and being used as the lookup value, then the format of both must match up. The one with the apostrophe is stored as text, the other is a number. Ignore the general along the top. One is text here and one is a number. If this is the one working, then convert the others in the column to text also. This could be done by selecting them as choosing Text from the menu that currently displays general. Then copy and paste values the results over the current table array cells. I am new to lookup function so I tried as per your instructions (even copied the exact data as yours) but it still doesn't work. What did I do wrong. Please help. Without seeing what you have I cannot really help with this. It is typically one of the situations mentioned in this article, but to know exactly what is going on I would need to see the spreadsheet + formula. I have an issue with the vlookup/match. For my case, the lookup value is not a value that I insert as input, but a formula. For example in A1=1 and A2=A1+1. The vlookup/match function is not behaving normal when I am looking for A2 in a table, ..sometimes it shows the N/A error and sometimes it works. If instead I write over in A2=2, then it works 100%. Because of the large number of data, this is not preferable for my case. Its always hard to say without seeing it but I would guess it to be an issue with formatting. The formatting of the lookup value and the first column of the table array must match. Hi, My query is i want to use vlookup in book 1 sheet 1, with book 2 to pull out the data, so in book 2 it is not taking the formula. Please help. You should be able to set this up in the same way as if they were just in 2 different sheets. Make sure Book1 is open when you begin the VLOOKUP in Book2 and you should be able to select Book1 and then Sheet 1 to highlight the Table Array. The finished VLOOKUP will be as normal with the Table array showing [Book1.xlsx]Sheet1! at the start. WOW , it's first time i know "VLOOKUP Cannot Look to its Left " this cause me lose more time . for years i don't know why Vlookup sometimes work and sometimes not :) . I am working with vlookup function since a long time,but nowadays I got my results with some N/A results as unique value is common in both tables and resulting data also presents there but also results N/A for some rows.Please suggest.. Sorry Saroj, I don't understand your question. The #N/A error will be present if it cannot find what you are looking for. It may be that the formatting of what you are looking for and where you are looking do not match. I'm trying to do a basic V-look up and once I've entered it, and hit return on the first cell, all the cell displays is the formula, it doesn't pull any information. I've had this before but can't remember the fix. It could be that the cell containing the formula is formatted as text. Check the drop down halfway on the Home tab. Or maybe formulas are set to be displayed. Check the Show Formulas button on the Formulas tab. Another mistake is to check your reference list for duplicates. If you think the lookup value is only in there once, you may be mystified as to why the correct value is not being returned, but Vlookup is bringing back the first instance it finds. Thank you for your comment Julian. Yes, when performing approximate match VLOOKUPs. make sure the calculation in the formula bar is on "automatic" rather than "manual"
I too got bitten by "VLOOKUP Cannot Look to its Left". I also could not get "LOOKUP" to work either for my dataset. The above solution is what finally did work for me, crazy that I can't do that in one command. Thanks so much! You're welcome Gregory. Thank you. I omitted False in the equation so I got a mismatch. Big thanks!